As vein problems first develop, people are somewhat concerned of their appearance or their vague symptoms such as end-of-the-day leg achiness. However, no one likes the bulging or obvious leg veins or the webbed discoloration of spider veins. For the most part, concerns end here until varicose vein problems progress. As blood back flow and pooling increases, veins can become engorged and become exaggerated and distended surface veins. While such veins don’t immediately affect overall health, one potential problem we see in our clinic is patients who have sudden bleeding from a surface varicose or spider vein. This can be quite alarming. The untreated varicose veins have a higher than usual risk of a spontaneous rupture and bleeding. Varicose veins, over time, grow larger, and as the vein wall stretches out, they weaken. These weakened veins are also under high pressure due to back flow (or reflux which is the underlying problem). The result of this high pressure condition can be a spontaneous burst and heavy bleeding. Patients often worry they have ruptured an artery because of the forceful pulsating-like high blood flow from the vein. We often hear of these incidents when a new patient contacts our office the day after a bleeding incident. A patient will describe that a sudden bleed occurred during a warm shower. The dilation or relaxation of the vein with warm water allows more blood to pool in the veins. Patients also report bleeding incidents at night while sleeping. They are awakened when they feel sudden, warm moisture around an ankle. Those patients on blood thinners can lose a significant amount of blood, especially if it occurs during sleep. In a state of near panic, patients or family members often call emergency services that transport the individual to the emergency room. Bleeding has usually subsided with elevation and external pressure during transport. We commonly see these patients the day following their emergency room visit. With duplex venous ultrasound we are able to locate the refluxing or incompetent saphenous vein leading to the problem or surface varicose or spider vein. We then provide our patients individualized treatment plans and recommendations. Patients with sudden varicose vein bleeding, usually require scheduling of procedures such as a thermal vein ablation with or without microphlebectomy to treat the problem. Patient instructions on managing bleeding, were it to recur before an upcoming vein treatment, are emphasized. Placing a wrap, applying pressure and elevating the leg will, most often, stop the sudden bleeding. If you or someone you know has experienced bleeding from a superficial varicose vein, it is important to see a vein specialist. Prevention is key; through appropriate diagnosis and treatment, sudden bleeding from a bulging varicose or spider vein can be avoided. 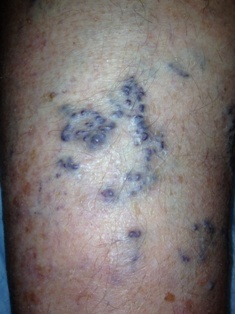 This is a familiar occurrence with varicose veins and is one we commonly manage at Minnesota Vein Center.